The map, which exhibits Anglican initiatives in the areas of development, relief and advocacy, is already live on the website – but many dioceses have yet to see their work displayed. It is designed to be a living resource – drawing Anglicans together through shared mission, providing publicity for individual projects and taking stock of the wealth of expertise across the Communion. 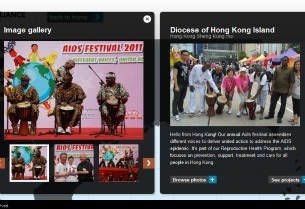 You can already see pictures of the work of the Church in Hong Kong, Zimbabwe, Malawi, Zambia Lusaka, Jos, Rochester, England, Chile, Uruguay, Peru, and Brazil. But there is space on the map for every diocese to display its work! Anyone involved with the development, relief or advocacy can provide information – whether a development desk officer, a women’s desk officer, a project officer or a member of the clergy. Registering projects easy and simply requires completing a user-friendly form online and supplying some photos. To get started contact the On-line Communities Manager Laura Payne by email at laura.payne@aco.org or by phone on +44(0)7983356454.